A Home for Me Email Rhonda Littleton at Rhonda@ahomeforme.sc. Abba Fund ABBA Fund has one application to complete whether you are applying for an interest-free loan or their family grant fund program. Adopt Together AdoptTogether is the world’s largest crowdfunding platform for adoption. Every gift you give brings a family one step closer to their child. Angels in Disguise Angels in Disguise partners with Show Hope, an international adoption aid foundation, to identify approved families who wish to adopt children with Down syndrome. They offer family grants so that these angels can join with their forever families. Both Hands Both Hands helps families fundraise for their adoptions. A family gathers a team of volunteers, and Both Hands coaches them to coordinate a service project fixing up a widow’s home. CMomA Childless Mothers Adopt (CMomA) is a 501c3 organization. They support childless single women, men, and couples who adopt our mission of helping children in need. Dave Thomas Foundation Children waiting in the foster care system vary in age, from infants to young adults. The average age of a waiting child is seven-and-a-half, and many have brothers or sisters with whom they should stay. The majority are healthy children who simply need and deserve loving and supportive adults in their lives. Every Child Has a Dream It is their desire to assist by providing financial grants to families who wish to welcome these precious children into their lives and hearts. Because they believe the greatest healing can take place when the Hope of Jesus Christ shared with these little ones, they have chosen to only provide grants to Christian families. They ask that your home study has been completed, and either you are pursuing a specific child, or you have already been matched with a child. They will accept applications from families who have a completed home study, but are not yet matched; however, matched families will take priority. 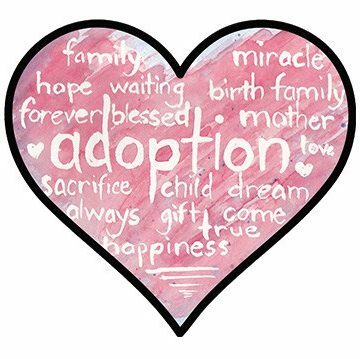 Gift of Adoption Fund Gift of Adoption awards adoption assistance grants to qualified U.S. families stepping forward to complete the adoption of vulnerable children. God’s Grace Adoption Ministry GGAM seeks to help Christian families overcome the financial burden of adopting children. Help Us Adopt Begin by contacting your state’s public agency or another adoption program like Wendy’s Wonderful Kids. They fund adoption professionals across the nation to implement aggressive, child-focused recruitment targeted exclusively on moving children from foster care into adoptive families. For more information, refer to their listing of recruiters across the nation. International Down Syndrome Coalition The Never Alone Foundation was born of a deep wish to honor and carry on the legacies of Laurel, Hannah, Zoe and Lucy Constantinides. Laurel was a true champion of adoption and more so, a true champion for love. And there was no more beautiful witness to this than in her three daughters. Laurel dedicated her life to the making of family. Through her daily life as a mother, through her work as an adoption social worker and through her constant support of the adoption community at large, she went out of her way to create family. These four people touched every person they met and brought light to the world. Katelyn’s Fund They endeavor to build upon their labor of love by continuing to create family and community through the gift of adoption. Lifesong for Orphans While many Christian families have the desire to adopt and resources to care for a child, initial costs keep families from following God’s call to adoption. Lifesong for Orphans helps bridge the financial gap in adoption fundraising to help bring children home. LoveGave LoveGave is an effort of churches collaborating TOGETHER to accomplish more for their cities than they could on their own. North American Council on Adoptive Children State Adoption Subsidy Adoption assistance (also known as adoption subsidy) provides financial and other supports to help adoptive families meet the basic and unique needs of children in care, including making it easier for the families to access medical care, counseling or therapy, special equipment, tutoring programs, and other services. Adoption assistance is designed to ensure that children have the best possible chance of finding and thriving in an adoptive family. Pathways for Little Feet Pathways for Little Feet has created a designated account called the Family Fund that receives donations and provides interest-free loans to eligible families. As loans are repaid, the money is put to work in new loans. Donations to the Family Fund not only help a single family; they facilitate an unlimited number of orphan placements for years to come. Show Hope Adoption Aid grants are the cornerstone of their work, and the original mission of their founders. One of the primary barriers standing between children and families is the cost associated with adoption. Their grants help break down that cost and have been a part of more than 6,000 children coming home. Sparrow Fund The Sparrow Fund cares for caregivers, supporting families in adoption, as well as those who care for waiting children. They give grants to families with financial need to enroll in programs specifically designed to provide counsel and comprehensive medical reviews of their referred child and offer training and connecting opportunities that foster community and growth. *This is a list that I compiled for adoption attorney, Raymond W. Godwin, P.C. Please do your research on each grant and loan as they each have their own restrictions and requirements. I am in no way affiliated with any of these organizations, and I am not responsible for any of the information or restrictions on their websites. This is merely a guide to help you navigate possible grants and loans. **Also, be sure to check with your local tax professional to see whether you qualify for the Adoption Tax Credit. The credit for adoptions finalized in 2017 is $13,570 per child, but certain restrictions apply.